We are writing to inform you of a new and exciting company in the Hampshire area. For Life Experiences provides fun, educational, professional, outdoor education courses, working with schools, youth groups, charities, NHS providers, corporate groups and the general public. Our main products are our Fish For Life courses. These projects have been made possible through support from the Environment Agency, Prince’s Trust and Shakespeare Tackle, resulting in truly amazing experiences! For Life Experiences is a company with a difference. Our aim is not just to provide a fun day (which we will! ), but to actually teach people the skills needed to make a positive impact on their everyday lives. Fishing gives people an option away from hanging around in the park or street corner. It gives them the opportunity to get out into the fresh air and have fun with their friends or family. Many lakes are free to fish and can be easily accessed. All you need is to be taught the basics. The lakeside is a perfect place to sit and relax, away from all the hustle and bustle of everyday life. We have over twenty venues available across the South of England so we can provide a personalised course near you. To be successful in angling you need to be focused, determined, patient, quite and observant; key skills to learn in all walks of life! While sitting quietly fishing together, many youngsters will open up to their teachers, counsellors or youth workers resulting in deeper friendships being formed. We believe this is because they are away from the classroom and in a completely non-threatening environment, working with the teacher or counsellor to outwit the fish. Boundaries can be broken down, friendships made and trust gained. We only have to read through the Governments’ ‘Education Outside the Classroom Manifesto’ to understand the true benefits achieved through outdoor education and healthy outdoor pastimes. All of our staff have many years of experience fishing but more importantly working with groups of youngsters and will provide the perfect personalised package for your group. Fishing is one of the most popular pastimes in Britain and in a recent survey 8 million Britons showed an interest in angling. This is no surprise as anyone can learn to fish, whether you are young or old, fit or unfit, able bodied or disabled everyone can enjoy the pleasure of being in the soothing environment of the lakeside. Due to our close links with the Environment Agency we may be able to part fund the cost of a For Life Experience, please phone or e-mail the office about this possibility as we only have a set funding budget available. Please visit our website at www.forlifeexp.com for more details and start to make a difference TODAY. This Sunday saw the launch of an exciting new company delivering fishing experiences in Hampshire. For Life Experiences has spent the last twelve months developing their Fish For Life Projects aimed to introduce people of all ages and walks of life to the joys of angling. 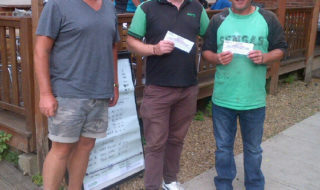 The event was held at the beautiful Eastleigh and District club’s Stoneham Bottom Lake. The sun was shinning, the fish topping and coaches excited as we set up for the day ahead. The event was completely free of charge and allowed people to come and have an hour’s fishing tuition with our experienced coaches. 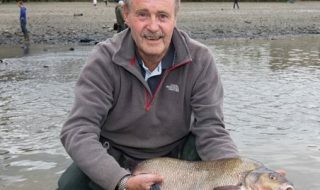 ‘Having worked for the past six years delivering outdoor education and development programs in both England and The States, I always thought that fishing could be an extremely powerful activity to help people appreciate the outdoors, focus, concentrate, reduce stress and relax’ said Graham Mabey – Director. 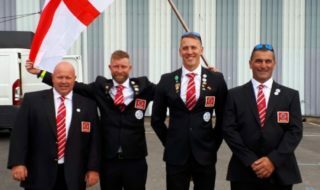 ‘With the support of Shakespeare Tackle, The Environment Agency and The Princes Trust, we are now able to deliver top quality, fun, educational, fishing outings around Hampshire’. Whether you would like a corporate fishing experiences, have a son or daughter who would like to learn to fish or have a school class or youth group who you think would benefit from fishing, we can put a personalised package together for you’. With everything set up and ready, the fist session started at 10am with teachers Paul and Steph, young John from a local youth group, Josh, Kya (age 5) and Brandon (age 8). Coaches Jim Rice, Larry Mabey, Terry Davison, Graham Wiltshire and Dave Phillips were in fine form and soon had everyone waiting with eager anticipation for their first bite. Everyone had fish with little Kya catching a number of roach topped by a 2lb Bream. Everyone did extremely well and the parents and youth workers could not believe the level of focus and concentration being used. ‘Fishing seems to have the power to stimulate and engross. Children who often cannot sit still or have limited attention spans in the classroom somehow become enchanted by the float. Hours pass by with patience, determination, concentration and focus being demonstrated. After fishing we review the skills used and try to promote their use in other areas of life’. One of the comments made by Kya’s Uncle at the end of the day read ‘Really good, helping the concentration levels of a five year old that usually has a short attention span’. As the sun rose higher in the sky it was soon time for the second session to start. Once again the roach continued to feed as the Carp, Tench and Bream seemed content to just sunbathe. Young Charlie and his friend Liam took the most fish, having a friendly competition between them. It was neck and neck all the way to the final minute. They finished the session with around ten fish each and left with huge smiles on their faces, sporting there free Shakespeare sun visors. The lake continued to produce fish throughout the whole day and everyone left with a new found love of fishing and a smile on their faces. The coaches also had a brilliant time. On entering Larry’s swim while he was coaching young Dodi, I heard singing and then discovered that Dodi was in fact teaching Larry nursery rhymes and they were both singing away to their hearts content. Bradley took the best fish of the day with a stunning Bream after changing from the whip to feeder fished corn and groundbait. 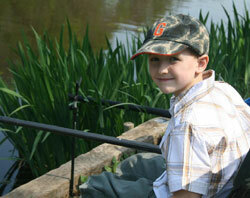 Top rod of the day had to go to six year old Miles Pearce who caught 25 fish in 45 minutes. Little Miles was a star and swung the fish into Coach Dave for him to unhook. Well done Miles! All in all it was a hugely successful day and everyone enjoyed themselves. Prizes were handed out along with bags packed with free goodies and information. Another fisherperson hooked for life! Thanks have to go out to Shakespeare Tackle, The Princes Trust and The Environment Agency for helping to make this adventure possible. Thanks to Chris Stringer Photography and Skyline FM for covering the event. Also a big thank you to all the coaches for their hard work and enthusiasm. For more details about For Life Experiences please visit the website at www.forlifeexp.com or phone 02380 550 263. Photography Copyright Chris Stringer Photography.